…remastered, obviously, but essential to the collection. It still sounds great after all these years, raw and unbridled. If it sounds like I’m fanboy gushing, it’s because I am. …like the first two albums in the Metallica discography, I’ve had this classic on pretty much all the formats: cassette, CD, MP3 download, and now vinyl record. Gads, I do need to get out and date more, don’t I? 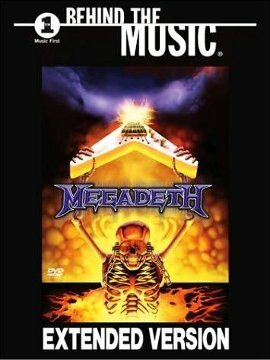 MEGADETH – Killing Is My Business…And Business Is Good! I really shouldn’t need to point this out, but in the interest of this blog post’s subject matter, I am a big Megadeth fan. Ever since getting my face sand-blasted off after purchasing Rust In Peace at the tender age of 17 — my first proper taste of the band, and it was a doozy — they’ve been very consistent with continually doing so, even during their low periods, more so than the Venom that spawned Megadeth’s Carnage, Metallica, ever did. I think I popped something reaching for that mixed metaphor. Yeah, I’ll be feeling that for a few days. Anyway, of the two Daves associated with the band, I’ve already read the biography for main man Dave Mustaine, and reviewed it quite a few years ago on my previous blog (it’s been moved here on this one, in case you were morbidly curious). A few months ago, while perusing the ebook selection on my Google Plus account, I came across the autobiography of the other Dave in the group, bassist and co-founder David Ellefson. I was rather jazzed to read this one; finally, we get the viewpoint of someone who had been with Megadeth and all the wackiness involved since the very beginning, save for a stretch where he wasn’t part of the band for…reasons. In My Life With Deth, Ellefson takes us through his upbringing in rural Minnesota, first getting interested in music, and working up to playing gigs in and around the surrounding Midwest area; moving to LA and befriending some guy named Dave Mustaine, forming Megadeth, getting into drugs and the struggle to break free from his addictions, his career with Megadeth to his leaving the band, his post-Megadeth ventures and careers, his resulting fued with Mustaine and eventual patching up of the relationship. Oh, he also touches on his Christian faith. Oh, yeah. Dave Ellefson’s a professing Christian. As such, not only does he talk about this, but each chapter ends with a brief “what I’ve learned from all this” takeaway. It’s definitely not something yo see in your standard rock n’ roll biography, here. Overall, My Life With ‘Deth is rather brief, and quite frankly seems to be missing a bit of meat. This may be Ellefson’s design, as he tells his tale less as an excuse to dish dirt and cause controversy, and as more of a “these were the mistakes I’ve made, let’s learn from this” kind of story. If you’re looking for something like Motley Crue’s biography The Dirt, you’re going to be sorely disappointed, I’m afraid. If you’re looking for a rather detailed, point-by-point analysis of one of the greatest metal bands to ever have existed…well, again, you may be less than satisfied with this. But, if you’re looking for some light reading and have some time to kill, My Life With ‘Deth is a good way to fill the time. I’m an admitted pop culture music history and trivia junkie. Have been ever since I picked up my first copy of Circus magazine back in 1988, and the infectious sounds of hard rock and heavy metal began to permeate the very fiber of my gelatinous being. Even the bands and artists I don’t like, I enjoy delving into their back story, getting a glimpse of what drove them, why they became what they are, etc. etc. So, obviously, VH1’s series Behind The Music was an obvious obsession of mine. Problem was, I never had cable or satellite to watch the cable show. I did catch a few, via friends cable. But even then, I missed out on some of my favorite groups featured. Megadeth was one of them. With this DVD of the show released, I finally got to watch the trials and tribulations of one Dave Mustaine and his merry band of metal miscreants (sorry…I’ve been reading too much Stan Lee-penned comics recently). His childhood growing up with an alcoholic and abusive father, running away at a young age and starting up with drugs, drinking and metal music, joining up with some band that called itself Metallica, getting kicked out of said band and starting up Megadeth…pretty much stuff I already knew after years of being a fan of the ‘Deth. And that’s probably the big reason why this DVD falls short for me, 45 extra minutes added or not. Just about every episode of Behind The Music focused way too much on the scandal rather than the inspiration, and that’s really what I’m more interested in. There’s only so much going back to his relapses into drug use that I can take before the “overkill” flag starts popping up in my head. Regardless of my limited (but still impressive) knowledge of the band, there were some things I found interesting…like the misfire that was the original cover for Killing Is My Business…And Business Is Good! (not the band’s fault; I remember buying my first copy and thinking how lame that cover was…glad that was cleared up), how Alice Cooper cautioned the band early in their career about their over excessive party habits, and later becoming a mentor for the recovering Mustaine, and how former Metallica mate Lars “I Sued Our Fans For File Sharing” Ulrich actually held Peace Sells But Who’s Buying? as a brilliant metal album. The extras, if you want to call ’em that, include the video for “Moto Psycho”, which apparently (if you read the above synopsis I ganked from Amazon.com) was too hot for either video channel. I don’t see how, as it’s pretty tame compared to their previous videos. Also included are interview segments from those featured in the show that were cut for whatever reason, a discography, and…other stuff I didn’t feel the need to go through. For the fans of Megadeth, there’s really not too much here that will shock your socks off. We already know this. And since I’ve never seen the original 1-hour broadcast (give or take a few commercial breaks), I don’t know what was added. This is pretty beefy, and I liked the perspectives of those who were associated with the band at one point in time or another. Saving that, this DVD is really more of a rental that a must-own-at-all-costs.